"Cover" is a philatelic term for an envelope, postal card, or similar postal artifact that has been sent through the mail (or is intended to be sent through the mail). The Massachusetts State Library was established in 1826. By the 1840s the space in the Massachusetts State House for the library was greatly overcrowded. One solution was to "farm out" duplicate materials to other libraries on the condition that the material could be recalled at a later date. Between 1853 and 1856 an addition to the State House was constructed which provided additional space for the State Library. The pending availability of this additional space prompted the State Library Board of Trustees to recall its loaned material in 1855. 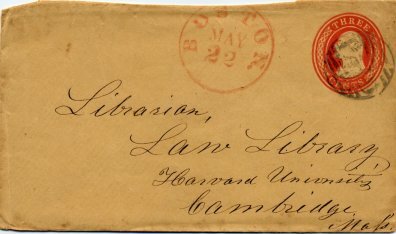 The envelope and enclosed letter featured here were sent to the Law Library of Harvard University requesting the return of materials loaned to that library. An additional reason for the return of the books was the preparation of a new catalog for the State Library. The cover is a pre-stamped envelope. These envelopes became available from the United States Post Office Department starting in 1853. They were heavily used by libraries. George H. Moore (1823-1892), the first paid librarian of the New York Historical Society (1849-1876) and later librarian of the Lenox Library in New York City (1877-1892), was also a noted historian in a "new school" of historical study which sought to approach history in a much more non-partisan and objective fashion than had previously occurred. In particular, Moore, in his 1866 book Notes on the History of Slavery in Massachusetts, challenged the prevailing view that Massachusetts had historically opposed slavery. Moore's efforts in revealing "Massachusetts' hypocrisy on the slavery question" resulted in his being referred to as the "tormentor of Massachusetts". Moore's philosophy of historical analysis is dealt with extensively in the book Slavery, Race, and American History: Historical Conflict, Trends, and Method 1866-1953 (M.E. Sharpe ,1999 ) by John David Smith. As is often the case, I was exposed to this knowledge about an early librarian through my research related to a postal artifact. 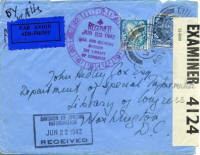 In this instance the postal artifact was a stampless, folded letter (shown below). 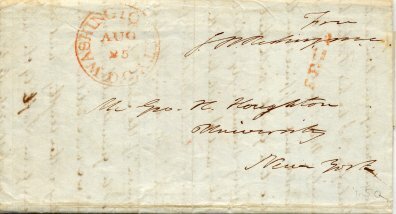 This one was sent to George H. Houghton by George H. Moore in August of 1842. An unusual aspect of this letter is that it has the "free frank" of a member of Congress. Although the signature used for the free frank is difficult to discern, I'm pretty sure it is for John Randall Reding of New Hampshire who served in Congress from 1841 to 1845. Moore's home state was New Hampshire. As he writes this letter, Moore is in Washington, D.C. doing research at the Library of Congress. Houghton and Moore were friends and recent graduates of the University of the City of New York. Both would be returning for graduate work in the fall. 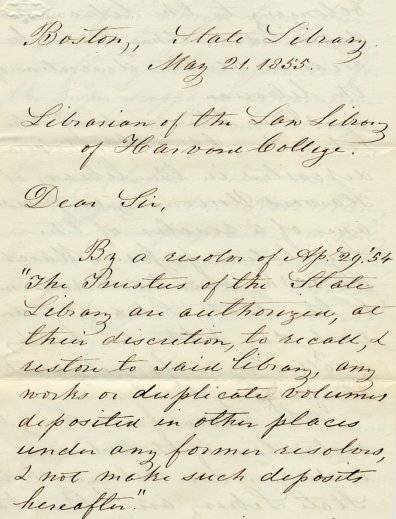 Moore makes reference in his letter to his work at the Library [at the New York Historical Society] where he worked while in school and he wonders if he will be able to "study law" and continue to work at the library at the same time. George H. Houghton is an interesting figure in his own right and becomes a prominent minister in New York City at "The Little Church Around the Corner". Houghton's church received this designation when an Episcopal priest refused to conduct the funeral service for the comic actor George Holland and suggested they try "the little church around the corner" where Houghton was the minister. This cover story first appeared on the Library History Buff Blog on October 25, 2010. I purchased this cover from a dealer at the American Philatelic Society's stamp show in Virginia in August 2010. From a philatelic perspective the cover is interesting because it was mailed "Special Delivery" from the Canal Zone and uses a United States 10 cent special delivery stamp in conjunction with two 3 cent Canal Zone stamps. The Canal Zone didn't have its own special delivery stamps. 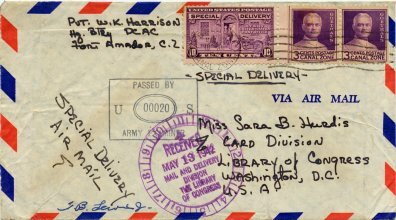 The cover was mailed on May 2, 1942 by Private W. K. Harrison at Fort Amador, C.Z. and was was passed by an Army censor. It was received by the Library of Congress on May 13, 1942. The most interesting thing about the cover for me, however, was that it was addressed to Sara B. Hurdis in the Card Division of the Library of Congress which linked it to the cover featured in the Library Cover Story for September 2010. It was Sara B. Hurdis who mailed that cover to her father Brigadier General Charles E. Hurdis. What are the chances of acquiring independently two related Library of Congress covers out of the millions of covers that have been sent to and from the Library of Congress? 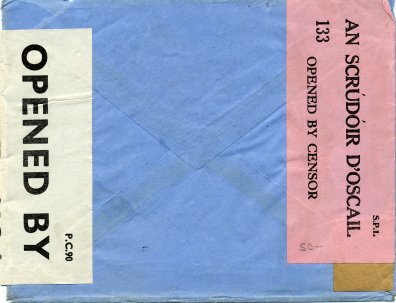 This "Official Business" penalty cover for the Library of Congress Card Division was mailed by "Hurdis" on June 12, 1944. It was mailed to Brigadier General Charles E. Hurdis via Army Post Office #6 in San Francisco. At the time General Hurdis was serving in the 6th Infantry Division where it was engaged in combat with the Japanese in New Guinea. Hurdis was later promoted to Commanding General of the 6th Infantry Division and ended his career as a Major General. 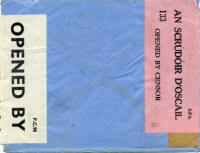 The cover is not in great condition which could be expected for a cover that was received in a combat zone. More information about the Library of Congress Hurdis will be forthcoming in the library cover story for October. The Division for Special Information was established in the Library of Congress in the summer of 1941 for the purpose of analyzing information and data bearing on national security. This meant obtaining and analyzing documents and publications originating in hostile nations. Neutral nations such as Ireland assisted the Library of Congress in obtaining some of these publications. The Library of Congress worked closely with the Office of Strategic Services, a predecessor to the Central Intelligence Agency, in this endeavor. The Division of Special Information grew to include 208 employees. In 1943 the unit moved from the Library of Congress to the Office of Strategic Services. Librarian of Congress Archibald MacLeish was an active player in the U.S. World War II effort as it related to information and served as Chairman of the Committee on Defense Information. In one of those odd ironies as it relates to freedom and defense, the United States Post Office ruthlessly destroyed tons of books, periodicals, and other documents coming into this country from adversarial nations during World War II. This resulted in libraries in the United States including the Library of Congress losing access to a significant aspect of the information record for that period. This interesting story is discussed at length in the book The Nervous Liberals: Propaganda Anxieties from World War I to the Cold War by Brett Gary (Columbia University Press, 1999). The Library of Congress also has an interesting online exhibit Freedom's Fortress about the Library of Congress during World War II. The envelope above was mailed from Ireland in June of 1942 and includes censor marks from both Ireland (on the reverse) and the U.S.
At the urgings of Librarian of Congress Ainsworth Rand Spofford all of the functions of copyright for the United States were centralized in the Library of Congress in 1870. This more or less guaranteed that the Library of Congress would become the largest library in the world. With this responsibility came an unbelievable amount of mail for the Library. Millions and millions of pieces of mail. 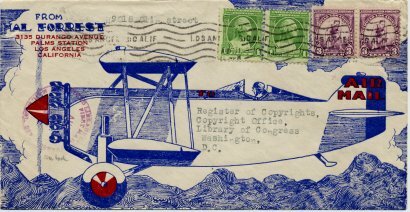 Perhaps no postal item received by the Library was quite as spectacular as the envelope featured here which was designed and mailed by Hal Forrest (1895-1959), creator of the Tailspin Tommy comic strip. The comic strip was started in 1928 and ended in 1942. The letter was mailed as best as I can tell in 1932 and Forrest was almost certainly seeking copyright (or at least information about copyright) for some of his material. The most interesting discussion of Hal Forrest and Tailspin Tommy on the web is on the Collect Air website. A gallery of some his work is located HERE. This cover story appeared as a post to the Library History Buff Blog on June 29, 2010. 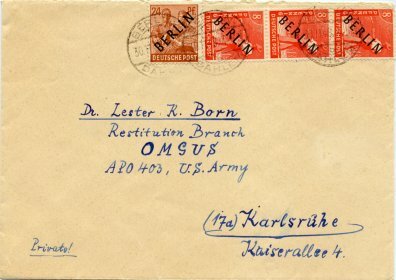 This cover was mailed to Dr. Lester K. Born in Berlin on November 30, 1948 while he was working with the Reparations and Restitution Branch of the Office of the Military Government, U.S. Zone. The return address on the back of the envelope indicates that it was mailed by Dr. Ulrich Wendland. Wendland served as the director of the Gdansk Archive in Danzig from 1941-1945 and is credited with helping to save parts of the archive in the last days of World War II. After his post-war work in Berlin, Born joined the staff of the Library of Congress where he held several important positions. Interestingly, however, an action which Born took while working for the Military Government in Berlin was responsible for an investigation of the Library of Congress in 1997 for possible acquisition of books and manuscripts that should have been restituted to the victims of the Holocaust. Born allegedly wrote a memorandum in the late 1940s while at the Offenbach Archival Depot in Germany which suggested that members of the Library of Congress Mission in Germany had inappropriately removed items from the Archives for the Library's collection. The result of the investigation was that the Library of Congress Mission had acted appropriately and that "the restitution of books to their proper owners was handled with diligence, care, and respect, and characterized by close attention to existing regulation". The investigation took place long after Born's career at the Library of Congress had ended. More on the investigation and the Library of Congress Mission in Germany can be found HERE. Born's positions at the Library of Congress included serving as Special Assistant on the Microfilm Program, Coordinator of Microreproduction Projects, and Head of the Manuscript Section of the Descriptive Cataloging Division. Born played an important role in the development of the National Union Catalog of Manuscript Collections at the Library of Congress. This cover story appeared as a post to the Library History Buff Blog on May 22, 2010. Early academic libraries, unlike those of today, were not very friendly to students. This led to the creation of student literary societies that established their own libraries which had more popular collections and more liberal lending policies. This was the case at Dartmouth College in New Hampshire. 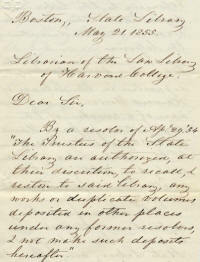 In 1783 a student literary society called the Society of Social Friends was founded at Dartmouth. A similar student society, the United Fraternity, was founded in 1786. For many years the libraries of these two student organizations were the primary source of books for both students and faculty. In 1817 in the midst of a controversy between the State of New Hampshire and the Trustees of Dartmouth over the control of the College, the student societies decide to move their collections out of Dartmouth Hall into a building controlled by the societies. The College attempts to prevent this and a student "riot" ensues. As a result both sides press charges and both students and faculty are arrested. The matter is ultimately settled out of court. The controversy between the State and the Trustees is settled in favor of the Trustees in a United States Supreme Court case argued by Daniel Webster (class of 1801). 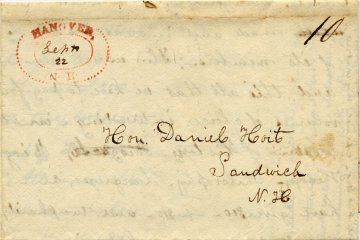 This month's cover story features a stampless letter (postage stamps didn't come into being in the United States until 1847) mailed by Dartmouth student Henry Hoit to his father Daniel in Sandwich, NH. 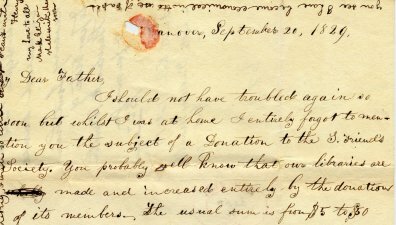 The letter is almost totally about the need for Henry to make a donation for the library of the Social Friends and the case for why his father should advance him the funds to do so. Henry writes in part, "You probably well know that our libraries are made and increased entirely by the donation of its members. The usual sum is from $5 to $50 and this is all that we have to pay for the use of 8000 volumes of choice, interesting, instructive books consisting of History, Biography, Travels, Theology, Philosophy, Languages, etc." Henry goes on to say that all in his class have given $10 except a few have given $15 and two "charity scholars" have given $5 and $7 respectively. There is a notation on the letter by Daniel Hoit that indicates that Henry was successful and that funds had been sent. Daniel Hoit or "General" Hoit as he was addressed because of his rank in the state militia was a prominent person in New Hampshire and had served a number of terms in the State Legislature. He ran for Governor on two occasions. William Henry Hoyt (he later changed his name from Hoit to the original family name of Hoyt) graduated from Dartmouth in 1831 and then went to Andover Theological Seminary. He was ordained first as an Episcopal minister but later converted to the Catholic faith and became a priest. Henry's brother Albert graduated from Dartmouth in 1829 and became a prominent artist. Henry mentions Albert in his letter. This cover story resulted from posts to the Library History Buff Blog on April 17, 2010 and on April 19, 2010. 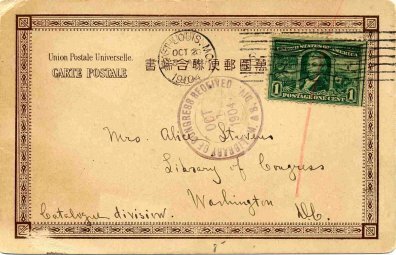 This is a Japanese postcard on eBay that was mailed from St. Louis, MO on October 20, 1904 to a Mrs. Alice Stevens at the Library of Congress. Its not often that you find a Japanese postcard mailed from a location within the United States. The postcard has significance to a library history buff and collector of postal librariana in that it was mailed by a librarian attending the 1904 American Library Association conference in St. Louis. George Eberhart has done an excellent job of recounting the ambience and significance of this conference which took place in conjunction with the St. Louis World's Fair (Louisiana Purchase Exposition). The conference ran from October 17 to October 22. 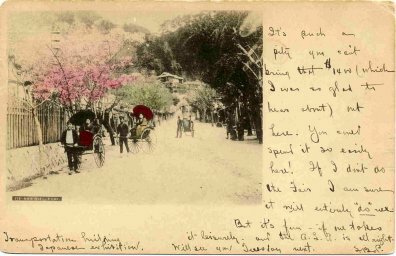 The personal message on the back of the postcard from someone with the initials S. B. P. reads in part: "If I didn't do the Fair I am sure it will entirely "do" me. But it's fun if one takes it leisurely and the A.L.A. is all right." The postcard came from the Japanese Exhibition at the Fair. The postcard is stamped with one of the stamps which is part of the Louisiana Purchase Exposition postal issue of 1904. It also includes a receivers mark made by the M. & S. Division of the Library of Congress. As Eberhart points out in his article, the American Library Association had a major exhibit at the Fair which was located in the Missouri Building. I have written a post about that exhibit in the Library History Buff Blog. The Library of Congress also had a separate exhibit at the Fair which was located in the U. S. Government Building. That exhibit included a large model of the Library of Congress building of 1897, now known as the Jefferson Building. This was the first direct participation of the Library of Conference in one of the large international expositions. This cover story appeared as an entry in the Library History Buff Blog for March 30, 2010. Any library that lends its books or other materials for use outside of the library must have a system for insuring the safe return of those materials. The Library Company of Philadelphia, America's oldest lending library, had an early system under which a member of the library signed a loan slip promising to pay five pounds if the book borrowed wasn't returned to the librarian undefaced. I'm not sure which library mailed out the first overdue notice, but high on the list of things most ephemeral must be overdue notices. In my quest for postal librariana one of the kinds of items I appreciate most are government issued postage pre-paid postal cards. 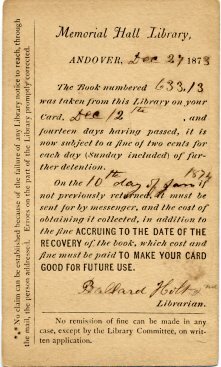 The United States Post Office Department began issuing these cards in 1873 and they were an instant success with the public, with the business community, and with libraries. 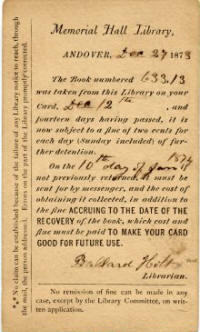 For one cent which paid for the card and the postage, a library could transact a variety of library related tasks including the mailing of overdue notices. 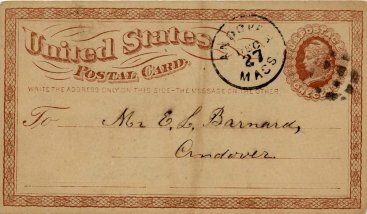 The postal card shown here was used by the Memorial Hall Library in Andover, Massachusetts to mail an overdue notice to Mr. E. L. Barnard of Andover on December 27, 1873. The card is signed by the Ballard Holt, the first librarian of the Memorial Hall Library. Holt did double duty as both the librarian and the janitor of the library. The the amount of the overdue fine was two cents per day. The overdue book is numbered 633.13, an apparent Dewey Decimal Classification number. However, although Dewey had submitted his classification scheme for consideration by the Amherst College Library where he worked in May of 1873, it was not until 1876 that it was published. I will make the claim that this is the oldest mailed overdue notice still in existence for a United States library until I am proven wrong. The Memorial Hall Library is still in existence and its history can be found HERE. Evidently the library doesn't charge overdue fees now except for DVDs. This cover story was also published in The Library History Buff Blog on February 16, 2010. The American Library in Paris is the largest English language lending library on the European continent. It is part of the legacy of the Library War Service of the American Library Association in World War I. It was founded in 1920 making this year its 90th anniversary. There is a good history of the library on its website. Part of that history is illustrated by the envelope/cover shown above. It was mailed on march 29, 1940 to Dorothy M. Reeder, director of the library 1936-1941. The envelope was mailed only a short time before the German occupation of France which began in May,1940. As recounted in the website history of the library, Reeder and her staff provided heroic service after the German occupation by operating an underground book lending service for Jewish members of the library who were barred from libraries by the Germans. One staff member of the library was actually shot by the Gestapo in a surprise inspection of the library. Mary Niles Maack has written an excellent article about the American Library in Paris during the period 1939-1945 which contains more information about Reeder's service at the library. The American Library Association Archives includes correspondence from ALA's Executive Secretary Carl Milam relating to the American Library in Paris including letters to Reeder. 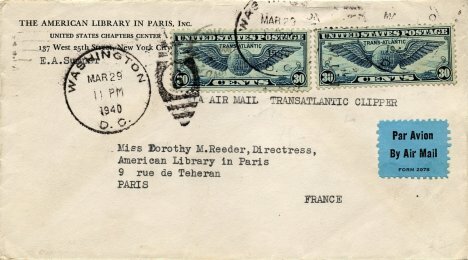 The envelope above was mailed by air mail via transatlantic clipper and was franked with two 30 cent airmail stamps which were needed for a double weight letter. It was mailed from the United States Chapters Center of the American Library in Paris in New York. 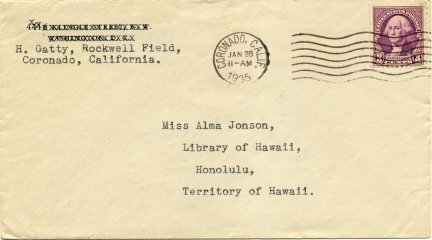 This cover was sent to Miss Alma Jonson at the Library of Hawaii on January 28, 1935 by Harold Gatty (1903-1957), the aviation navigator who was called "the prince of navigators" by Charles Lindbergh. In 1931, Gatty was the navigator for Wiley Post on their record breaking flight around the world. Although he was Australian, Gatty worked for a time for the U.S. Army Air Corps. 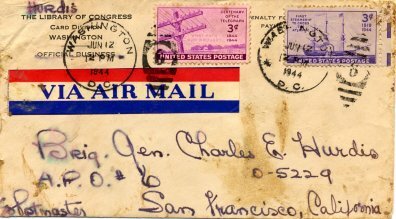 This cover was mailed from Rockwell Field, Coronado, California where the U.S. Army Air Corps was located. Alma Jonson who was a librarian at the Library of Hawaii did research for Gatty over a period of years. Some of the research was conducted by Jonson as an employee of the Library of Hawaii and some was done for pay outside of her work. Although this particular cover did not have an enclosure, I came across a letter from Gatty to Jonson offered for sale on the Internet. That letter was dated January 27, 1935 and may have been sent in the cover that I have. The letter reads in part: "The information you sent definitely proved U. S. occupation of 21 years, which will go a long way to establishing U.S. jurisdiction. It is very important that nothing get out about these islands at this time. The Navy and State Department state that occupation at the present time will make the establishment more certain so we are making a move to send an expedition down there to establish occupancy. I am very interested in the information regarding the other islands which you sent me and I appreciate it very much. I would like to get copies of any information pertaining to Midway, Wake, Johnston, Palmyra, Fanning, Jarvis, Howland and Baker...". One can surmise from this letter that the U.S. Army Air Corps is interested in establishing air bases on islands in the Pacific. I have two other covers sent from Gatty to Jonson at the Library of Hawaii and I have a letter sent by Jonson to Gatty in 1938. From that letter it is clear that Jonson is performing research on the side for Gatty. In the letter Jonson refers to the purchase of covers for Gatty which indicates that Gatty may have been a collector of philatelic covers.